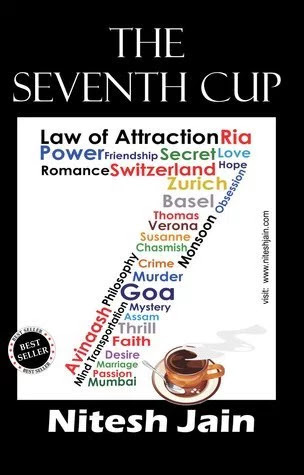 REVIEW- The Seventh Cup is psychological thriller authored by Nitesh Jain. The Concept of Mind Transportation was totally new to me and it helped me read the book in one go. Book Title and Cover- Book Title and Blurb creates questions about the story, why protagonist drinks exactly seven cup of coffee in same restaurant. The questions raised plays positive role and catches attention of the readers. Book Cover is simple yet interesting. Language and Narration- Language of the book is simple and easily understandable. Narration is decent. Short and crispy dialogs are favorable. Mystery,romance,suspense and Mind Transportation hooked me till the end. One liners in the book were catchy. Author has good writing skills which i am sure you'll get to know while reading the story. Lots of twists and turns with perfect characterization makes reading easy. Story flows smoothly and ends mysteriously. There are some unreal sentences in the story with grammatical mistakes which should be considered in next edition of the book. Overall The Seventh Cup is thriller novel with new concepts. If you're into thriller or psychological thriller you should go for this.